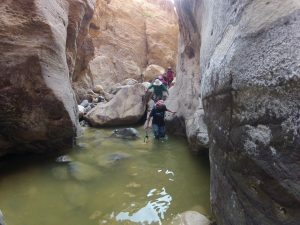 A tantalizing glimpse into our latest Jordan expedition. Now this one sounds superb…. Next trip date May 2018. After a short 5 hour flight from Europe we found ourselves safely landed at Amman International airport. Eight friends, several of whom were celebrating milestone birthdays, and yours truly, charged with getting them through the whole experience in one piece. The usual worries about sorting out visas and getting through immigration smoothly were allayed by our very own “Mr Fixit” Jamal who met us almost as we stepped off the plane and proceeded to usher us through immigration and customs at lightning speed before making sure we were safely on a bus for the short trip to our comfy downtown hotel and a good nights sleep. Day two was always going to be about a lengthy transfer south to the starting point of our trek but was made much more enjoyable by stops to see an amazing 6th century floor mosaic map of the Holy Land and the superb lunchtime views from Mount Nebo, resting place of Moses. A coffee stop at a nearby gift shop also gave an opportunity to buy the traditional Jordanian red and white headdress known as a Keffiyeh, ideal for desert sun and sand protection. After an afternoon’s drive down the bleak and featureless desert highway our excellent guide for the day Abdullah showed us around the crusader castle at Shoubak before saying goodbye and leaving us with Yousef and his team of fellow Bedouins who would be looking after us for our five days of trekking. 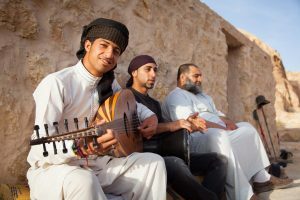 Bedouin people have hospitality embedded in their history and culture and are amongst the friendliest in the world. As we stepped off the bus we were ushered to sit around an already blazing campfire where sweet tea was brewing and Salah our cook had prepared a meal of spicy soup followed by a tasty chicken dish with rice. After a long hot day traveling it was an early night for all with the option of sleeping in the traditional communal Bedouin tent or taking your mattress off to a quiet spot and sleeping under the stars. Even living in a rural area of the UK doesn’t prepare you for a Jordanian desert night sky. Lying in your sleeping bag gazing upwards you suddenly realise just how small and insignificant our planet is in the universe. Shooting stars ten a penny and the milky way like you’ve never seen it before. Day three saw a dawn rise and a slightly chilly breakfast before setting off on our first day’s trekking down the Wadi Feinan, one of Jordan’s thousands of “hidden” canyons. Hamza, who was to be our daily trekking guide, set an easy pace as for the first hour we walked downhill in the early morning light to reach the top of the canyon. I’ve been fortunate to trek all over the world but the next eight hours rank among one of my best day’s walking ever. 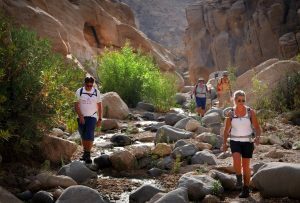 The wadi revealed itself to be the most stunning canyon. At times we were walking between towering walls of red rock soaring upwards into the sunlight, so narrow you could almost touch both sides at once. Then a boulder to cross, a pool of clear water to jump into, around the next corner palm trees and brightly coloured birds flitting through the sky. To find it opening out was almost a disappointment and back in the full view of the sun we climbed a short scree slope to reach camp for the night on a rocky plateau with distant views to an ancient Roman copper mine. 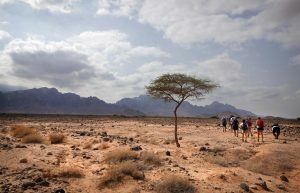 The next day, a walk through rocky desert, was a much shorter day which with the lack of shade was always going to be welcome. An early stop was made at a village where over more drinking of sweet tea a deal was struck for a young goat which was to be our dinner that evening. 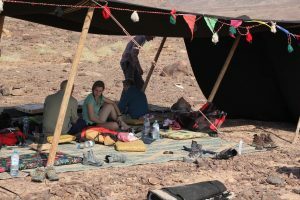 Camp that night was at the base of the mountains with panoramic views over the Jordan valley and to the hills of Israel beyond. Shortly after our arrival our cooks killed the goat in a quick and efficient manner. As I watched the expert butchering I reflected on the differences between the West where most people enjoy eating meat but we remain completely detached from the process in which it arrives on our plates. Here was an animal that had been raised outdoors and enjoyed a relatively stress free life being brought to the table in a way that hasn’t changed for centuries. Nothing went to waste, a starter of delicious fried offal followed by barbecued ribs and chops, all around a campfire under that amazing sky. Day five saw us up and out of camp early with the aim to reach the base of the mountains before the sun rose over them. Mission accomplished we set of on what was to be our longest and physically hardest days trekking but one again of great beauty walking over several mountain “saddles” with verdant valleys and wind blown rock sculptures between them. Camp that night was our highest, on a beautiful flat rock plateau with views back over the mountains to the distant desert where we’d slept the night before. After watching an epic sunset there followed another great campsite meal and more games before we fell asleep to the distant howls of Arabian wolves. The next morning found condensation on sleeping bags from the colder high altitude night temperatures but warm tea and coffee helped thaw cold fingers before setting off on our last long day’s trekking. 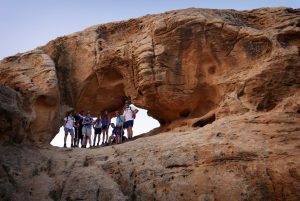 Trekking down the valley to a dried river bed we passed more beautiful wind blown sculptural rock formations including a natural arch before a hot steady climb of 90 minutes found us on a ridge with literal 360 degree views. 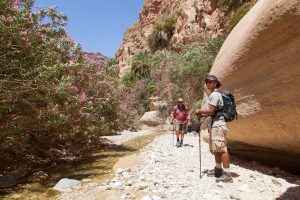 The remainder of the day saw us trekking into an increasing lunar type landscape as we approached the Petra region. That evening was supposed to be our last night camping but instead we stayed at a small traditional Bedouin house that had been built by Yousef’s grandfather. An impressive traditional Bedouin barbecue was followed by birthday cake washed down by strong Petra beer that our crew had surreptitiously bought to surprise us. Our last night sleeping under the stars was on the small terrace outside the house with our Jordanian friends sleeping on the roof above us. All slept soundly apart from one lady awoken by a somewhat slobbering kiss from a local donkey stretching over the wall. Day seven saw us all piling into Yousef’s pick up for the cross country drive to the “back door” into Petra. After presenting tickets we walked the short 6km to reach the stunning Monastery, the largest structure in this ancient desert city. Dating to 300BC this incredible place was the capital of the Nabatean kingdom and unknown to the western world till 1812. What has amazed me on every visit is how this beautiful city wasn’t “built” but was carved from the canyon walls and we had the whole of the rest of the day free to wander at leisure soaking up this wonder of the world. After a last look at the iconic “Treasury” we wandered up the slot canyon known as the Siq to the town of Petra and to check into our hotel looking forward to a night’s sleep in a bed…..but not before a few cheeky drinks in the 2000 year old Cave Bar – rude not to really. A very happy team..covered in mud! The next day saw us setting of for two much deserved days “R&R” at the Dead Sea. A drive through “Sodom & Gomorra” and a wistful look at Lot’s “pillar of salt” wife got us in the mood for a swim and a cold beer in what proved to be a beautiful resort at the world’s lowest point 420m below sea level. Two days of mud, comedy bobbing, great food and wine saw us ready to return home, again all ably “fixed” by the fantastic Jamal. 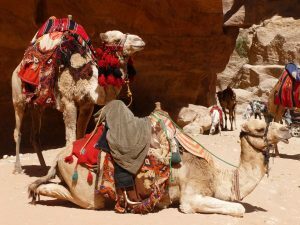 So why visit Jordan? Well its an amazingly beautiful country. It has history and culture. And it has Petra, an iconic ancient city on most people’s bucket lists to see. Oh and did I say the people are amongst the friendliest in the world. Is it safe? It’s once vibrant tourist industry has undoubtedly been affected by regional troubles, However we always felt completely welcome and safe at all times. One of the consequences of the current situation is Petra is as uncrowded as it probably ever will be. In my opinion there’s never been a better time to go. As to the eight….what a great bunch of people. Nick, Maria, Angus, Goo, Nick, Paula, Sue and Ann-Marie, it was a blast. If you have been captivated by this expedition then why not JOIN US and SayYesMore on the May 4th 2018. The cost is £1850 pp which includes your international flights! Monthly payment plans are available. You just have to ask!